“There is also an upgrade pack in Finecast to make an Autarch on a jetbike. -You can make Run moves in addition to shooting Shuriken weapons. -Shuriken weapons have a rule which makes them ignore armor on a to-wound roll of a 6– similar to rending, but it’s not actually the Rending rule. -The Wraithknight starts at about 250 points and caps around 350, and towers over even the Tau Riptide. It’s 9” tall. The Wraithknight has the ability for its weapons to become twin-linked if it hits with a scatter laser it comes equipped with, even against airborne targets. It can shoot S9 and 10 small blasts, and has a total of four weapons on it– you have a choice of several, including a huge wraithblade and a lance weapon. – Wraithguard are cheaper both points-wise and financially speaking, and are now S5 and T6, and have the option to be equipped with Wraithblades as per the current Codex’s in place of their guns, making them a dangerous close combat unit. 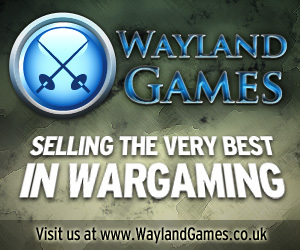 – Including a Spiritseer as a HQ choice allows you to bring Wraithguard as Troops. – Expect Guardians to supplant Dire Avengers as the staple Troops choice– they’re very points efficient and with the buff to shuriken weapons, they should expect to be in a lot of competitive armies. This box contains a multipart plastic kit that makes one Eldar Wraithknight, this completely new Walker stands a massive 9 inches tall and can be constructed with a variety of armaments to fulfill a range of battlefield roles. This box contains a multipart plastic kit that makes either a Hemlock Wraithfighter or a Crimson Hunter, both new Eldar Flyers. The Hemlock Wraithfighter is a Psychicly armed bomber designer to cause havoc among enemy troops while the Crimson Hunter is an all new aspect warrior class whom excel at aerial combat. This box contains a multipart plastic kit that makes either 5 Wraithguards previously only available in metal or 5 Wraithblades, a new type of deadly close combat warrior. A plastic Clamp pack containing 1 Eldar Hero in a dynamic mid-casting posse. New Finecast ReleasesWarhammer 40000: Illic Nightspear· A clampack that contains one highly detailed Citadel Finecast resin miniature sculpted by Edgar Ramos. Illic Nightspear is an outcast who has become an deadly assassin armed with the sniper rifle Voidbringer. Warhammer 40000: Eldar Spiritseer· A clampack that contains one highly detailed Citadel Finecast resin miniature sculpted by Mike Fores. Armed with a Witch Staff and spirit stone wearing a distinctive eyeless helm.Available While Stocks LastThese Items are highly limited, please request the quantity you require and we will supply you as close to this number as we can. Imperial Amour Volume Three Second Edition – The Taros Campaign, released today. And our final news that new Tau custom trays are now available to buy from Battle Foam. If you have any lingering doubts that Eldar are coming…. this should calm them. Some stunning pics of some of the new Eldar models can be seen over at DakkaDakka! I personally love the new flyer! he cat is now out of the bag, and more pics are floating around with people claiming that they have seen the White Dwarf and are giving their reports. – From what I saw all the non Wraith infantry have the run/shoot shoot/run ability (the rule was called Battle something). Avengers definitely do (from the report) and Rangers definitely do (from tiny printed profile in the WD) as well. Not sure if its just for Shuriken weapons (Rangers do have Pistols I guess). 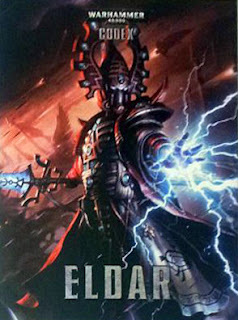 – It looks likes all Eldar have the ‘Ancient Foe’ special rule, no idea what this does but I suspect its something like Hatred Daemons of Slaneesh (don’t think it was Necron related as the report was against Crons) since all Eldar appear to have it (including the Wraith units). – There are 14 Eldar specific psychic powers from 2 different charts, Runes of Battle and Runes of Fate. However it looks like several of the powers are 2 in 1, i.e they have a buff mode and a debuff mode, so there are actually HEAPS of powers. I.e the Primaris for Battle is Conceal/Reveal (as a single card/roll etc), Conceal gives you Shrouded and Reveal removes Shrouded from an enemy. The 1 on the Battle Chart was Destructor/Renew(? ), Destructor being the same as before with Soul Blaze added and Renew allowing you to restore a wound to a friendy model within range (18″ I think). Primaris for Runes of Fate was Guide, which is now 24″ range but is otherwise the exact same as before. Very surprising to see this as aside from the range it is far worse than the Divination Primaris (although I guess you could take both and effectively Guide two units). The 1 on the Fate Chart was a terrible Focuses Witchfire power. Fortune and Doom are still options (the Farseer in the report had them) and appear to have the same effects. – Wraithguard and Wraithblades look good, think scaled down Wraithlords. They looked a bit bigger than the old ones, but I think it was partly just the added range of motion in the poses on 40mm bases (similar to the old 25mm base Terminators vs the newer 40mm base ones, they are bigger but the better poses help as well). Wraithguard can now get either Wraithcannons (which from the fluff descriptions seemed to still be single shot and very powerful) or D Scythes which were described as a multi shot weapon but it could still Pen vehicles on a 6. Wraithblades are only 1A base (sadly) but looked like they could go either 2 CCW(no idea on stats of their weapons, but they appeared to have sword/axe options) or 1 CCW + Shield gen arm. – Wraithguard are definitely S5 T6, Lord is almost certainly not T6 (a full unit of Destroyers shot one in the report and did nothing, which suggests T8 or some other equivalent buff). No idea on the stats for the Knight. – Rangers have WS4. They also have a character (not sure if he is upgrade or HQ) who has a 120″ range Sniper Rifle. 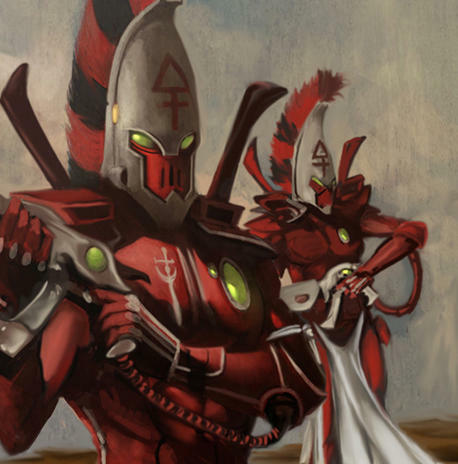 – One of the fliers has 2 Heavy D Scythes on the wings and a psychic based main gun. The other has 2 Bright Lances and a Pulse Laser. – Saw stats for what looked like special weapons for characters, might have been for Special Characters as well since the 120″ range sniper was in there. One weapon was +2S, AP- Melee, Rending, Fleshbane, Instant Death. Another was +1S AP3, Soul Blaze, and if you killed anything with Soul Blaze then every unit within 6″ of that unit would become effected by Soul Blaze as well. There was also a one use only piece of wargear, which you could use when the character died. On a 2+ you place a S4 AP3 template over the character, hitting both friend and foe, but if you cause at least 1 wound then the character stands back up with 1 wound. Last one I saw was an item which gave the user Fearless, Shrouded, Stealth and re-roll cover saves but they lose the IC rule, which gives people a way to make a Solitare (the name was something to do with the Laughing God).